Corporate Ownership: Central San Vicente, Inc. Rubert Hnos., Inc. In 1839, Hacienda San Vicente had 838 "cuerdas" and was owned by Jacinto Lopez, by the 1850's it was the largest sugar producer in Vega Baja. Upon his death in 1863, Lopez inheritance went to his four children; Manuel Antonio, Teresa, Maria Luisa and Josefa Guadalupe. Soon after the partition, Manuel Antonio acquired from his sisters Maria Luisa and Josefa Guadalupe their participations in Hacienda San Vicente making him the largest shareholder of the Hacienda together with his other sister Teresa. Manuel died ca. 1865, and soon thereafter his widow Maria del Carmen Landrón Córdova married Leonardo Igaravidez Maldonado (1830-1888), son of a Spanish immigrant and a "criolla" or Puertorican born mother who was later known as the Marqués de Cabo Caribe due to a nobility title granted December 14, 1872. Leonardo received the payments on the deferred balance of the purchase price of Hacienda San Vicente as agent for Josefa Guadalupe, who was married to Carlos Santana, brother of his now deceased first wife Avelina Santana Rivera. In June 1866 Teresa sold her shares in Hacienda San Vicente to Antonio Florencio Garcia Pacheco, a priest, who in October of that same year sold it to Igaravidez, who then, together with his wife Maria del Carmen, became the sole owners of Hacienda San Vicente. Other haciendas that later on became part of San Vicente by outright purchase or by foreclosure for unpaid debt were: Felicidad, owned by Francisco Náter; Santa Inés (the first Hacienda with a steam driven mill in Vega Baja), owned by Ramon Soler; Rosario, owned by Antonio Dávila later Sucn. Dávila and Encarnación, owned by Pedro Prado later Sucn. Prado. Igaravidez was related to the Náter and Prado families by marriage; Dolores Náter married Leonardo's brother Felipe Igaravidez Malodonado and Juan Prado married Leonardo's sister Cándida Igaravidez Maldonado. In 1873 Leonardo finished the installation of a 60 hp steam engine bought in France from Cail & Co., five Cornuaille boilers which produced power for the water pumps, distillery, Derosne triple effect evaporators, Hodeck condensers and Rohlfs-Seyrig centrigugals, making it the first sugar mill or central sugar factory established in Puerto Rico. 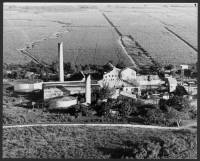 Instead of adopting the concept of centralization which called for sugar mill owners to devote themselves exclusively to the industrial process of sugar fabrication and for landowners to devote themselves exclusively to the cultivation of sugarcane, Igaravidez attempted simultaneously to expand the mill's grinding capacity and the acreage he owned dedicated to cultivating sugarcane. In its beginning, San Vicente was a highly efficient and successful operation producing the highest grade of raw sugar. In its first harvest season, its output reached 2,300 tons of sugar or 2.5% of the islands total output, which figure met the highest expectations for the new venture. Due to the increased cost of financing, the substantial investment in machinery and the high cost of planting the vastly superior amounts of of land, for the first time in October 1879 Igaravidez officially defaulted on the payment of some of his obligations. In late 1883, after 4 years of battling in court, Igaravidez was forced into bankruptcy and sent to 4 years in prison for fraud and embezzlement. Out of jail in March 1887, Igaravidez continued to deal in the solution of San Vicente's financial problems based on an agreement reached with creditors and supervised by a referee commission called to intercede in favor of creditors in case of default on the periodic payments of installment obligations. Upon Igaravidez's death in March 1888, Julian Blanco y Sosa was appointed San Vicente's administrator, job he satisfactorily performed. Despite legal opposition from Igaravidez's stepsons Manuel, Armando and Rafael Lopez Landrón, in January 1889 José Gallart Forgas obtained a writ of foreclosure on an 80,000 pesos note subscribed by Igaravidez in favor of the New York firm of Sturges & Co., bought with Igaravidez's consent by his uncle Juan Forgas. It took the courts 6 years to finally decide the settlement of Igaravidez's estate and by 1895 the central was dismembered and distributed to the López Landrón brothers, José Gallart Forgas and other creditors. The production facility awarded to Gallart Forgas was sold in 1896 to Central San Vicente, Inc. whose shareholders were the Rubert brothers who also had ownership interest in Mercedita-Yabucoa , Cortada and Constancia-Toa Baja together with the Rafael Fabián Fabián. By Joint Resolution of May 1, 1900 , Congress provided that; "every corporation hereafter authorized to engage in agriculture in Puerto Rico shall by its charter be restricted to the ownership and control of not to exceed five hundred acres of land." This limitation was carried over into the Organic Act of Puerto Rico enacted on March 2, 1917 . Since 1900 the provisions of these laws were never enforced but in 1935, the Legislative Assembly of Puerto Rico enacted two laws to provide the means of enforcing the Congressional prohibition. Act No. 33 conferred upon the Supreme Court of Puerto Rico exclusive original jurisdiction over quo warranto proceedings instituted for violations of the 500 acre law. Act No. 47 authorized the Attorney General of Puerto Rico or any district attorney to bring such quo warranto proceedings in the Supreme Court of Puerto Rico against any corporation violating the Organic Act, and provided further that when any corporation is unlawfully holding * * * real estate in Puerto Rico, the People of Puerto Rico may, at its option, through the same proceedings, institute in its behalf the confiscation of such property, or the alienation thereof at public auction, within a term of not more than six months counting from the date on which final sentence is rendered." In 1937 the first suit was filed by the Attorney General of Puerto Rico under these statutes against Rubert Hnos., Inc., then owners of San Vicente. 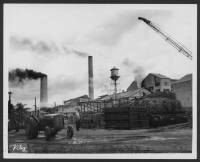 The complaint alleged that respondent corporation was organized in 1927 under the laws of Puerto Rico for the purpose of acquiring and working sugar cane farms and plantations, that its articles of incorporation restricted it to the acquisition of 500 acres, that it had nevertheless acquired and was working at the time of the filing of the complaint, some 12,188 acres of land. On July 30, 1938 the Supreme Court of Puerto Rico entered judgment for the petitioner. It ordered "the forfeiture and cancellation' of the license and articles of incorporation of respondent, the immediate dissolution and winding up of the affairs of the corporation, and the payment of $3,000 in fine and costs". On the same day, petitioner moved that a receiver be appointed to handle the dissolution and disposition of the respondent's property. In all, 18 suits were filed against: Fajardo Sugar Company; South Porto Rico Sugar Company; Central Cambalache; Central Alianza; Central Coloso; Central Plata and Pepino Associates; Compañía Azucarera del Toa; Eastern Sugar Associates; Aguirre Associates and Affiliates; Carmen Centrale and Ana María Sugar Co.among others. These Lawsuits had a substantial negative effect on the sugar industry because of the sugar factories need to have access to over 500 acres of land to satisfy their production demands. They were an important contributing factor to the demise of the sugar industry on the island. As it turns out, San Vicente was the first sugar mill established on the island and the first one affected by the implementation of the 500 acre land law 30 some odd years after it was enacted. In 1962 Jorge Gonzalez Hernandez was the principal stockholder and CEO of Central San Vicente Inc. and was also a "colono" cultivating sugar cane on lands owned in his name and in the names of Compañia Agricola Mendez, Inc and Central Agricultural Co., Inc. On September 1962, after the discovery of serious shortages of sugar at Central San Vicente's warehouses, Central San Vicente, Inc. was declared insolvent and was placed in receivership by the Superior Court of PR and creditors filed a Chapter X Bankruptcy petition. On November 1962, Orlando de Aragón, an employee of Central Mercedita, was appointed as Trustee by the Court. On January 29, 1965 a reorganization plan was confirmed by the court wherein all the assets of Central San Vicente, inc. would be transferred to a new corporate entity, the new Central San Vicente, Inc. Owners of the reorganized corporation would be the Government Development 51%, Chase Manhattan Bank 20% and the remaining 29% would be distributed among unsecured creditors. After its closure in 1967, it was dismantled and its machinery and equipment sold in Honduras where it was known as Central La Grecia in the town of Choluteca.